Here’s the second instalment of Expiscor (last week’s can be found here). This is a weekly digest of interesting things discovered this week. Enjoy! April Fool’s was last week. Here’s some fun entomological content – A ‘tadpole eating Lepidoptera‘. Far-fetched? Maybe not… there are carnivorous Leps in Hawaii. A more historical perspective on April Fool’s day – Darwin on the HMS Beagle was fooled, too. 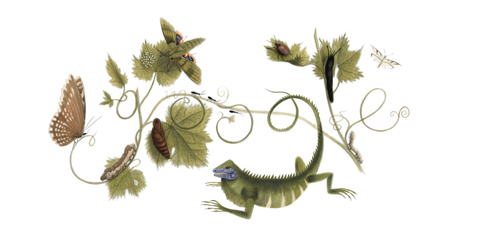 There was lots of discussion about a Google Doodle this past week – in honour of Maria Sibylla Merian – an artist with a passion for nature and a particular fondness for insects. Interestingly, before that Doodle came out, Nash Turley wrote a nice blog post about her. In that post, he states: “In the 1600′s the general consensus (apparently) was that butterflies generated spontaneously out of rotting mud“. Very cool. Beethoven liked it fast: while driving to visit family last weekend, I listened to RadioLab‘s short about Beethoven – perhaps he meant his music to be played MUCH faster than what we are accustomed to now. Simon Leather is continually tweeting about the (low) number of Invertebrate papers that appear in Ecological Journals – in an article he wrote a few years ago, there is good evidence of bias against invertebrates, and the situation is likely the same today. That’s a shame. I came across this article about famous painters – and their ‘first’ paintings – amazing to see how their styles changes – e.g., see Dali’s most famous work compared to his first (when he was six)! Well, that just gusts me. Twelve lonely, negative words. Thanks to Dr. Dez for pointing that out on twitter! Spring -it’s really, really approaching! Managed to see thousands of snow geese around the Quebec-Ontario border. They are magnificent, as is their migration. This is a very interesting, insightful and important tweet from Sam Evans, a graduate student in Ohio. Message: keep your eye on the ball and remember that you’re doing great work, and making important contributions.